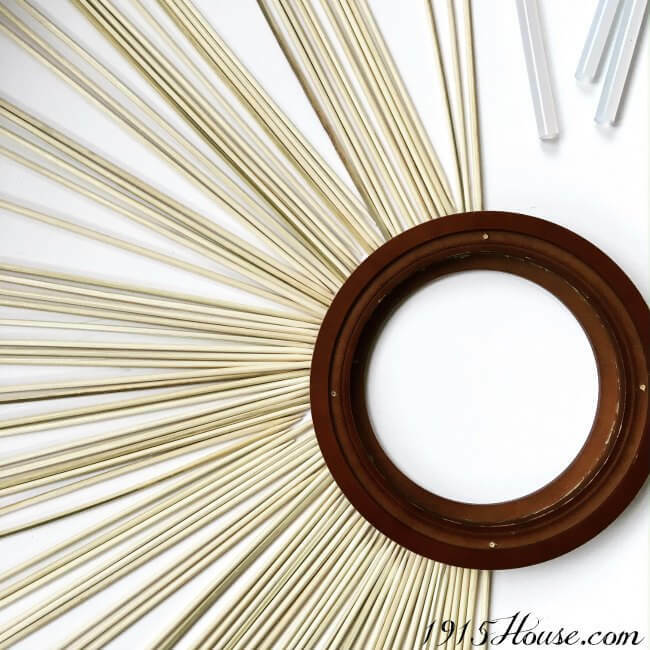 You can use any old round clock that you already have on hand. The one I used for this project is one I’ve seriously had for a bunch o’ years. I almost threw it away a few times when we moved, but I couldn’t bring myself to toss something that technically still worked. So it sat in a closet all by it’s lonesome for a long time. I decided to try and see if I could turn this sad little clock into a fantastic sunburst clock. I figured I can’t ruin something I already don’t like, so why not? If I fail, nothing is lost…but if it WORKS?? Then I have a great new piece for my office! I decided to give it a go. 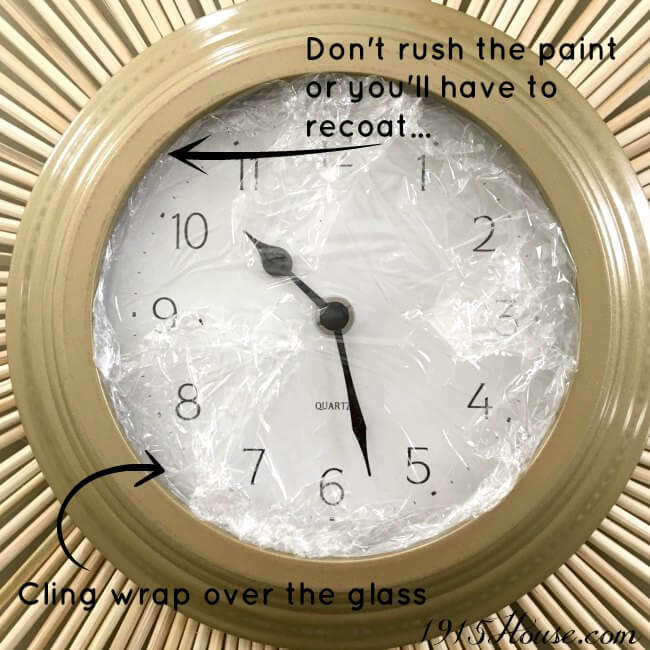 First, I removed the clock body and glass from the frame – I had to get creative with removing the glass face because it was glued in, but yours may not be. Then, just to get an idea of how it would look and how big the end result would be, I laid out the skewers around half of the clock. It was at this point, I realized I would have to paint the frame of the clock first, so that I could re-attach the clock body in order to have space to provide enough support for the skewers (they’re pretty long). So I painted the clock frame and re-attached the glass face and the clock body. 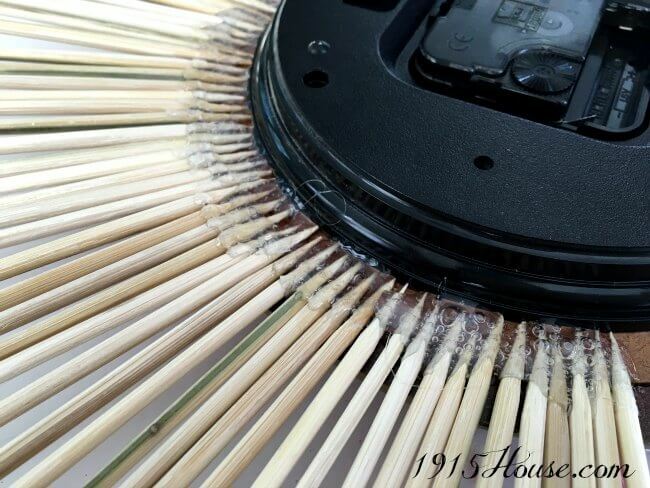 Then I hot glued the skewers onto the back. Easy peasy. You can see the little hot glue strings here – remove them if they bug you. Then I placed cling wrap over the glass face of the clock so I could spray the skewers. No gold paint on the glass face, please. Let it dry and voila! 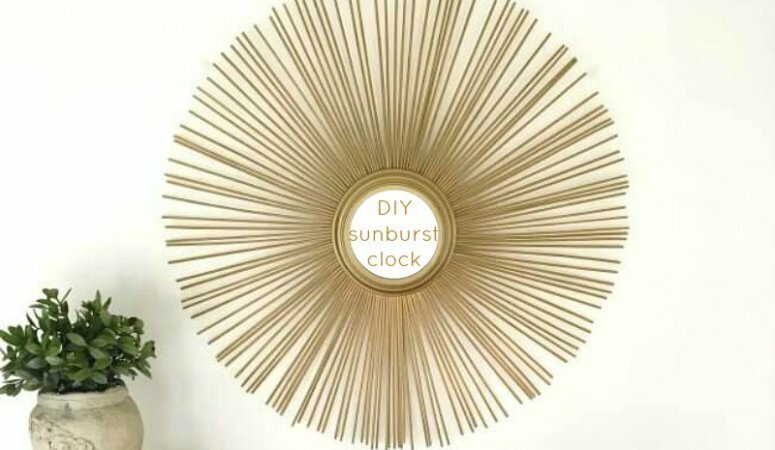 The sunburst clock is finished – and it’s gorgeous! It now happily resides in my office (that I gave a complete makeover for less than $100) and brings a little touch of glam to my space. 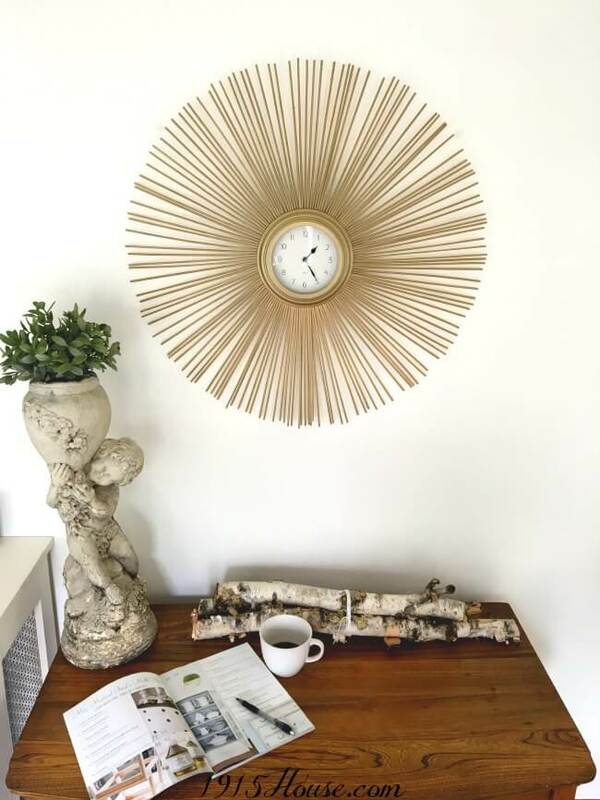 Maybe you’re not a DIYer but you love the look of a sunburst clock? Check out some of these fun options! 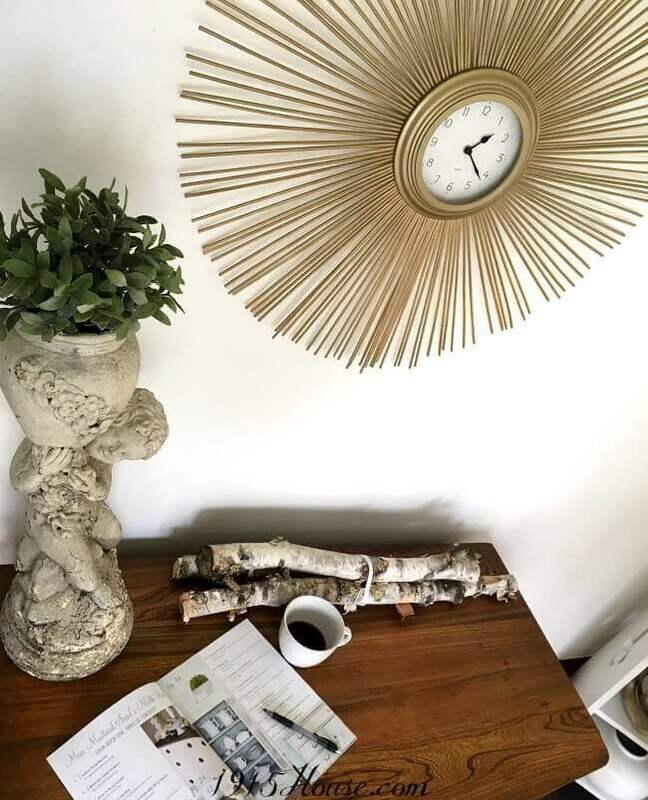 Such a fun upgrade to sad, boring old clock – all all for under $10!!! I love this clock and the ingenuity behind it. Sharing. Visiting from BOB Tribe. Very Mid Century modern, I love it. Thank you so much Christy! I’m so glad you like it- 🙂 Blessings, friend! I need to make one of these for our master! I love how yours turned out! Swoon! When I saw the photo of your starburst clock I couldn’t imagine how you made this!!! Once I saw your post I see it was pretty simple but the idea is nothing short of genius. Love it!!! That was so easy!!! Definitely a project I could do without gluing anything backwards, lol!! Love it!! This is just a fantastical project. At first glance, it looks like it would be a challenging project. Your tutorial shows just how simple it is. I have seen similar clocks and mirrors that cost all the many dollars. You pulled off the look for less with style my sweet friend. 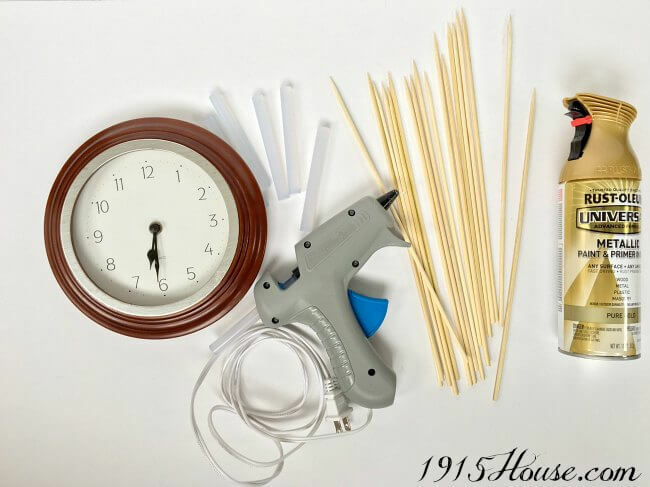 Oh my goodness – hot glue guns can be really dangerous, can’t they! 😮 I’d love to see your project when you’re done, if you care to share! 🙂 Have a great day!